Last week, I went to the Menlo Park city council meeting that covered Caltrain’s plan to extend commuter rail across the San Francisco Bay. Trips to the East Bay represent the largest share of miles that I drive. I probably go to SF more often, but take Caltrain a decent share of the time. I never take public transit to the east bay, because of the “you can’t get there from here” factor. It’s physically possible to do it, but it takes about twice as long, so someone who has another option wouldn’t do it. A good proportion of Bay Area Socialtexters who have convenient access to public transit get to work by train or bus, or bike, and we have a couple of employees who live in the east bay who might take public transit if it was more convenient. So a train across the bay sounded like a pretty good idea to me. The council meeting was educational. Dozens of people came out from the neighborhood that would be affected by the train, who were either concerned or adamantly opposed. They didn’t want a train through their backyards; and funding for features like grade crossings and sound barriers weren’t clearly available. People were seriously worried that the plan was a stalking horse for freight rail. Apparently, Southern Pacific has the legal right to take freight trains across the bay if the tracks are upgraded to handle freight. For people who live near the tracks, a freight trains running all night long would be horrid. The projections of commuter ridership didn’t do a lot to dispel the fear that commuting wasn’t the main purpose of the program. The ridership estimates were low — only about 6,000 passengers per day, about 10% of the car traffic across the bridge. The Caltrain did not seem to have end-user benefits as clear priorities, with only six rides per day. Options to cut costs in various ways would cut connectivity as the first resort to cutting costs, dumping passengers in Newark, without a train connection. It was not clear why the ridership estimates were so low; perhaps because the proposed service is not very convenient. Some city council members and community members are pushing for a bus rapid transit option instead of the train. This could be more convenient, cheaper, and less noisy. I got up and spoke in the interest of people who would benefit from better cross-bay commuting, even though it was scary to speak amid the parade of people arguing vehemently against the route. The meeting was an excellent education on the the difficult dynamics of regional transit in the bay area. The transit agency representatives sounded more interested in upgrading their trains than serving commuters, or making sure that people who lived by the tracks would still have livable neighborhoods. The room was full of people who didn’t want a train in their back yard; and there was only one speaker (me) providing personal testimony about benefits. Given the risks to the oil supply and global warming, I think we are going to very badly need improved regional transit. Right now, organizational dynamics make it harder to do. p.s. As far as I could tell, the Almanac and the Palo Alto Daily didn’t cover the session. There is no local media to be found. Why do caterpillars hang from trees? They bungee jump from a silk thread in order to flee a hungry bird or other threat. They can crawl back up the thread or descend to the ground. How do beavers build their dams and lodges? With great variety and flexibility, never the same way twice, depending on the weather, landscape, population, and other factors. Animal Architects discusses insect silk, beaver dams, birds nests, bee hives, and other examples of animal building. The stories are fascinating in themselves, and the thesis is tells a larger story. The authors use numerous examples, from stereotyped wasp nests, to the highly flexible building strategies of beavers, to build taxonomies of mapping, from stimulus-response to concept-building, and social intelligence, from isolation to multi-dimensional decision-making. The picture of animal intelligence is much richer and more nuanced than the “stimulus-response” behaviorist school. There is a strong perceived dichotomy between “intelligence” and “instinct”. It can be seen in today’s article Washington Post article about a recent scientific study showing that humans pleasure centers are stimulated by acts of generosity and kindness. The article quotes neuroscientists and philosophers suggesting that these scientific studies take moral judgements outside of the realm of morality and into the domain of physical determinism. “Joshua D. Greene, a Harvard neuroscientist and philosopher, said multiple experiments suggest that morality arises from basic brain activities. Morality, he said, is not a brain function elevated above our baser impulses. Greene said it is not “handed down” by philosophers and clergy, but “handed up,” an outgrowth of the brain’s basic propensities.” But the expression of morality – like other aspects of human behavior — intertwines instincts, emotions, culture, and reason. The interesting thing isn’t nature or nurture, it’s the fascinating combinations. Here’s a very interesting post from a blog in Houston, a metro area that has even greater problems with auto-dependence and transit fragmentation than the Bay Area. The post describes a coordinated intermodal system used in a multi-centric region of Germany that has four different types of transit used for different needs, including inter-city travel, commuter travel, and city travel. The pieces are designed to knit together, minimizing transfers and supporting easy transfers from mode to mode. The kicker — the region in question covers the same amount of geographical area as Houston, which covers over 10,000 square miles in 10 counties. The Bay Area is somewhat smaller, about 7,000 square miles in 9 counties according to 511.org. Conclusion: it is possible to create a coordinated transit system in a spread-out region with multiple metros. p.s. The German system serves about 5 million residents, with 640 million trips in 2005. The Bay Area has about 7 million residents, with about 500 million trips per year. The Bay Area’s usage of a less well-integrated integrated system is 55% of theirs, measured in trips per person per year year. 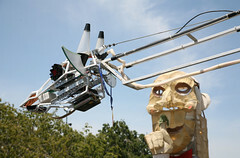 The Robot Giraffe and Bicycle Carousel were both very cool. The robot giraffe walked forward and backward with a leggy lope, controlled by a crane-like joystick, and moved its mouth to talk. The wiring and hydraulics and power system were all visible. The bicycle carousel was a two-person ride in a horizontal circle, powered by happy looking folks pedalling. The esthetic was thorougly anti-disney; the technology and power was all visible, there was no illusion or slickness. Participants are engaged, not transfixed. * the two open source cellphone projects ( OpenMoko and Silicon Valley Homebrew Mobile Phone club, both of which claim they will have kits available in a month or so. Brainstormed with Liz about ways of using digitized fabric and clothing to bridge the Make and Craft worlds. A blue jeans patch keyboard? A wristband remote control? A gps system that gave a light tap on the foot instead of lecturing with directions. Ouch. Where will we go for local news? Bloggers aren’t keeping up; the bay area has five times the population and if there’s great local civic blogging I have yet to find it. There are great tech blogs and food blogs and mommy blogs, but less on the “what’s going on here”. I miss Austin Bloggers.